Innovative land management could replenish wetlands and limit flood damage. Bob Marshall stands atop the earthen levee at Myrtle Grove in Plaquemines Parish, Louisiana, about thirty miles south of New Orleans. We are in a community outside the system of levees that defend the city and surrounding parishes from the sort of storm surges and flooding that devastated the region when Hurricane Katrina hit in 2005. The Army Corps of Engineers completed the $14 billion project to rebuild that system last summer. But despite the massive upgrade, the areas on both sides of the levees remain dangerously vulnerable. Marshall is a tall, handsome man with a thick head of graying hair and a winning smile. The former outdoors editor of The Times-Picayune and a Pulitzer Prize winner, he is now a staff writer covering coastal issues for the Lens, an online investigative journal in New Orleans. We are about to spend the day observing the rapidly crumbling Mississippi Delta. But even before we set out, we get a lesson in the complexity of the issue and the conflicts and contradictions that make attacking it so difficult. On one side of the Myrtle Grove levee is a network of canals leading to the Gulf of Mexico, most of which support oil and gas development, which began in Louisiana’s coastal wetlands in the 1930s. For decades, the oil and gas companies blatantly disregarded the environment as they dug canals for access to the wells; federal permits were not even required until 1972. To this day, new devastation is continuously revealed, most vividly following the 2010 BP oil spill, considered the largest in history, which discharged an estimated 210 million gallons of oil into the already fragile delta. On the other side of the levee are rapidly sinking wetlands. It took 6,000 years for the overflowing sediment of the nearby Mississippi River to build these delta marshes. But, Marshall says, it has taken only seventy years for the levees and shipping canals to put the marshes in jeopardy. Without the river’s continuous nourishment of new sediment and fresh water, saltwater from the Gulf penetrates the estuaries, killing the plants that hold the soil and opening the way for rapid shoreline erosion. Since the 1930s those forces have turned nearly 2,000 square miles of cypress swamps and marshes into open water. In 2007, Congress approved the Myrtle Grove Diversion, a land-building project that would pipe in sediment to help replenish the wetlands, halt erosion and provide increased storm protection. Congress has not yet funded the project, and with each storm, more wetlands disappear. But even with adequate funding, significant obstacles would remain. Engineering the diversion would require approval from property owners to build across privately owned parcels of land. And the diversion would have an impact on all residents in the area because the salinity of the water would change from brackish to fresh, which would affect fishing. But residents disagree about what’s best for the region. 80 percent of coastal wetlands are privately owned, the government also stands in the way of much-needed improvements. “On principle, this state hates to interfere with private property,” he says. “Eminent domain is time-consuming, complicated and can get stalled in courts anyway.” But what’s available is “quick-take authority,” a more streamlined way of expropriating property for a public purpose. The state doesn’t want to use this authority to advance any of these rebuilding projects, either. But it does allow the utilities and oil and gas companies to use it when it serves their private interests. Our boat ride takes us past houses that not long ago rested on an island but that are now on stilts in deep water. Small, rock-laden spits of land remain viable nesting places for pelicans, but only because they are constantly being sustained and rebuilt by dedicated private organizations. We also pass the Lake Hermitage marsh restoration project, a joint federal-state effort that replenishes a critical area with river sediment and water. Here, as in so many other places in the region, a small-scale strategy offers a solution to the crisis that is applicable on a wider scale, funding permitted. Inside the levees, there is a whole different set of complications. But despite the differences, conditions in the city are similar in important ways to those on the coast. And modifying entrenched paradigms is difficult here, too. The protected side sinks dramatically, just like the vast expanse of marshes. But here, this natural process of “subsidence” is accelerated by a highly engineered system of pumps and drainage canals created 100 years ago. Streets buckle, building foundations shift, walls crack. Worse, the city floods easily during periods of torrential rainfall. The system doesn’t have the capacity to handle such rapid intake, so the water has nowhere to go until the pumping process runs its course. That’s why you see kayakers moving through the streets after a heavy rain. If you drive around New Orleans with David Waggonner, you’ll hear the same kind of innovative thinking and deep frustration heard from Marshall. Waggonner, a bespectacled man with a soft voice, is a Louisiana-born architect with the New Orleans firm Waggonner & Ball, whose work ranges from historic preservation to environmental design. After Hurricane Katrina, Waggonner traveled to the Netherlands with Louisiana Democratic Senator Mary Landrieu to explore how that country survives and thrives below sea level. There, he saw the remarkable success of a government-funded strategy to manage excessive rainfalls and improve civic life at the same time. The features that contain the water during floods, he learned, can be transformed into recreational and visual assets during dry periods. Out of that trip came a partnership with the Dutch Embassy in Washington and a series of workshops that focused on how canals can serve as parks and pathways that are allowed to flood during storms, when the city needs greater water storage capacity. With a multidisciplinary team of Dutch planners, engineers, urban designers and soil experts, among others, Waggonner has adapted some of these ideas to suit New Orleans’s needs. The innovative approach he has developed, called “Living With Water,” could drastically reduce the subsidence of the city’s soil, save money and create new public amenities. Other US waterway cities are beginning to take notice. When you hear how difficult it has been to implement such common-sense ideas, it is easy to share Waggonner’s frustration. We drive along Napoleon Avenue, for example, one of the city’s several boulevard-like thoroughfares with a broad, grassy median known as the “neutral ground.” “Look at how high the ground is, which means water pours from it into the street,” Waggonner says. “It should be the reverse. It could retain water and be an attractive landscape at the same time. Instead, the Army Corps of Engineers is building a giant culvert underneath, bigger than the existing one, to store and then pipe water out to Lake Pontchartrain without rebuilding the neutral ground atop it to reduce runoff and enhance surface storage.” There are several projects planned in the Uptown area, more expensive and less attractive than the alternative Waggonner proposes. This “lost opportunity” is compounded by what Waggonner calls a “criminal act”: drastically cutting back the long-limbed live oak trees that line the boulevard so that large cranes can come down the street to work on the culvert. The citywide canopy of trees, one of the most distinctive features of the city, has the practical benefit of cooling the streets in the summer. Why the project managers did not decide to preserve the trees by using the kind of cranes that fold down, and that are in use elsewhere in the city, has never been explained. A bit further toward the lake is the most blatant lost opportunity, which prompts even more anger from Waggonner. Costco, the giant retailer, is building a huge facility on Carrollton Avenue, between the neighborhoods of Hollygrove and Gert Town. The structure is elevated according to FEMA’s post-Katrina standards. This makes it higher than the surrounding neighborhood and guarantees unimpeded runoff “quickly and directly into the adjacent drainage canal already severely challenged to carry water from further ‘upstream,’” notes Waggonner. Reports indicate that the amount of energy the city is consuming to expel storm water through the pumping system is off the charts. The Living With Water strategies would not replace the pumping system but would supplement and balance it, thus easing the strains already on it. Waggonner likens this approach to “adaptive re-use,” like modernizing an old building. With less pumping and a more stable water table, city land would subside less and the urban landscape would improve. The effects would be dramatic. Publicly, Landrieu has praised Living With Water, and although no demonstration projects have been funded, the city recently received a grant from the Rockefeller Foundation’s new RE.invest Initiative supporting a proposal based largely on Waggonner’s work. 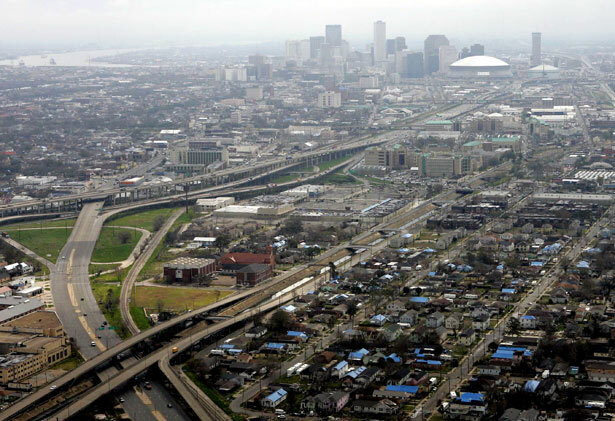 New Orleans was one of eight cities selected to create a model for financing twenty-first-century resilient public infrastructure by teaming up with private partners. It is too soon to know if this funding will lead to specific projects. The Living With Water project Landrieu has embraced with the most enthusiasm is the Lafitte Greenway, which would transform a blighted landscape into an appealing waterway. Currently, fenced-off grass fields sit adjacent to a cement-walled, litter-filled drainage canal. Waggonner’s face lights up as he describes his vision for a ribbon park that would extend three miles from the Lafitte Housing Development at the northern edge of the French Quarter through Bayou St. John, a waterway in the high-priced Uptown neighborhood, to Canal Boulevard. The plan would make room for waterfront parks, biking trails, kayaking and canoeing, and cafes. Vacant industrial properties along the shore would be ripe for development. Other benefits would follow. Water is a cooling medium, Waggonner explains, so new and enlarged water features such as those in the Lafitte Greenway plan would serve as a natural air-cooling system. So far, the city has agreed only to create a bikeway. But the Trust for Public Land, a nonprofit conservation organization, has stepped in to raise funds to advance the larger project. Although it is taking a while to get some big ideas funded and off the ground, at least one modest effort is inching forward. The Bayou Bienvenue Wetland Triangle in the Lower Ninth Ward, once a healthy cypress swamp and the only site in the city with a coastal landscape, is gradually regenerating. The reversal began with the closing of the Mississippi River Gulf Outlet, which was opened in 1965 as a shipping shortcut from the Gulf to the port. Nearly four years after the MRGO was closed, salinity is down. Pelicans and fish are returning. Canoers are exploring. Purified effluent from a nearby sewage treatment plant will replenish underwater soil to which cypress roots can eventually attach. It is perhaps not surprising that this restoration project was initiated by the local community, advanced with volunteer efforts, and appropriately picked up by the city and state, with plans in the works to replant cypress. Like the Lake Hermitage marsh restoration project, the MRGO closure is an effective local strategy that can serve as a valuable model for larger restoration projects. Community efforts to build awareness of the solutions are key to generating funding support for such ambitious plans. One of the best things to happen on a wider scale has been the involvement of R. King Milling as head of the America’s Wetland Foundation, whose mission is to alert the nation to the severity and financial impact of coastal devastation. Milling, former head of the Whitney National Bank, is one of New Orleans’s and the state’s leading businessmen. He has also served as head of an independent commission, established in 2001 by former Louisiana Governor Mike Foster, that brought together industry, environmentalists, scientists and cultural and community interests to reorganize the state’s plans and structures. Out of that came the Coastal Protection and Restoration Authority, which brings “all interested agencies and parties” under the jurisdiction of one committed agency, notes CPRA director Garret Graves. There is now a master plan filled with good projects that could replenish the delta. Funding seems elusive, but, says Graves, “we have forty innovative funding sources,” including the BP oil spill settlement, to pull from. Despite strong encouragement from environmentalists, Milling was initially reluctant to become involved with the America’s Wetland Foundation. But he signed on in 2001 because, he says, “this is about business and the enormous potential loss to the country.” That is why the foundation, along with other organizations, is taking the issue up the Mississippi, to Memphis, St. Louis, Chicago and other places, to emphasize the national dimension of the Louisiana coast and ports. A broader understanding may help create more congressional support, especially within business communities up the river, for delta regeneration projects. According to Louisiana’s 2012 Master Plan for a Sustainable Coast, 90 percent of the nation’s outer continental oil and gas, and about 20 percent of its maritime commerce, ships through Louisiana ports. This coast is also the winter habitat for 5 million migratory water fowl, and it accounts for 26 percent (by weight) of the US fisheries catch. In “I Got Shot in New Orleans,” Mark Hertsgaard writes that he’s not giving up on this precious, important city, and America shouldn’t either.